Before I got into this music I wanted to be an originator ; I wanted to be original". Founding member of the legendary group Underground Resistance as a 'Minister Of Information' with ‘Mad’ Mike Banks & Jeff Mills, his seminal works on Jeff Mill's Axis and his very own M-Plant imprint paved the way for a wave of stripped-down dancefloor minimalism that directed much of techno's path throughout the late Nineties. Robert Hood makes minimal Detroit techno with an emphasis on soul and experimentation over flash and popularity. "Growing up in Detroit, I grew up with Motown in the house - a lot of Motown and Philadelphia soul, artists like Marvin Gaye of course and Curtis Mayfield. I remember Isaac Hayes, the soundtrack from ‘Shaft’ had come out. My father was a jazz musician; he played piano, trumpet and drums. My mother was in an R’n’B group. We listened to a lot of Motown - in fact, my grandfather’s first cousin is Berry Gordy. "I was influenced by my father - I wanted to play trumpet like he did." Robert's father tragically died when he was just 6. The photo of Robert siting down holding a trumpet is his fathers. "I had to beg my grandmother to let me borrow the trumpet to take a picture with it" In the early 90's he began to concentrate on his own production 'Vision EP', the 'Riot EP' and X-102 were big stepping-stones for him as they were the first releases he worked 100% on his own. The X-101 to X-102, were Waveform Transmission projects with Mills for Tresor. He slowly progressed to work more and more on his own, but collaberated on some of the first Axis releases with label owner Jeff Mills as H&M (Hood & Mills) with ‘Tranquilizer EP’ and ‘Drama’. He soon decided it was time for him to start his own label to focus on what was in his soul musically. M-Plant started in ’94. I had developed this “grey area” sound - what I mean by that is that in Detroit, even when the sun is out, there’s something in the atmosphere. I don’t know if its pollution or whatever, but the sky has that grey haze over it. It’s got to be something from the industrial factories there. I’d never really heard a sound like that before and it came from a Roland Juno - it was a chord sound that really went along with my depiction of what Detroit was at that time. A lot of buildings were abandoned and there was a lot of lifelessness in the city, especially downtown. The M-Plant, in minimalism, kind of reflected that. I remember thinking of Detroit like a museum. You know, like a work of art standing still, suspended in time. There wasn’t a whole lot of activity going on. Releasing singles such as "Internal Empire,", “The Protein Valve” "Music Data," and "Moveable Parts", "The Pace", more recently "Range", "Alpha" and that isn't even touching his other monikers Floorplan, Monobox, The Vision, etc. "M-Plant is what I've always wanted to hear: the basic stripped down, raw sound. Just drums, basslines and funky grooves and only what's essential. Only what is essential to make people move. I started to look at it as a science, the art of making people move their butts, speaking to their heart, mind and soul. “It's a heart-felt rhythmic techno sound. M-Plant is just M. minimal. 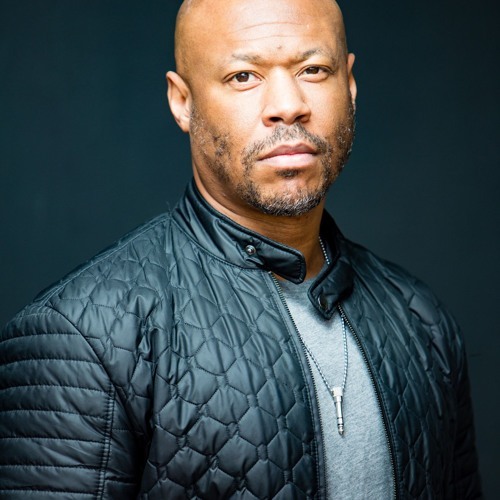 “ Although his desire to remain underground has been replaced by an urge to reach a wider audience, mainly via his housier, disco, gospel moniker Floorplan with his daughter Lyric Hood, Hood remains fiercely critical of artistic and economic movements destructive to inner-city communities and has combined his musical enterprises with outreach and social activist ends.